Amazed, he immediately replied, “Yes, go ahead”. Let me first make it clear. It is not just any event. It meant getting online and making flight purchases. It meant checking to see if there were seats available. It meant looking for a place to stay when we got there after a 2.5 hour flight and another 1hr travel by rail. 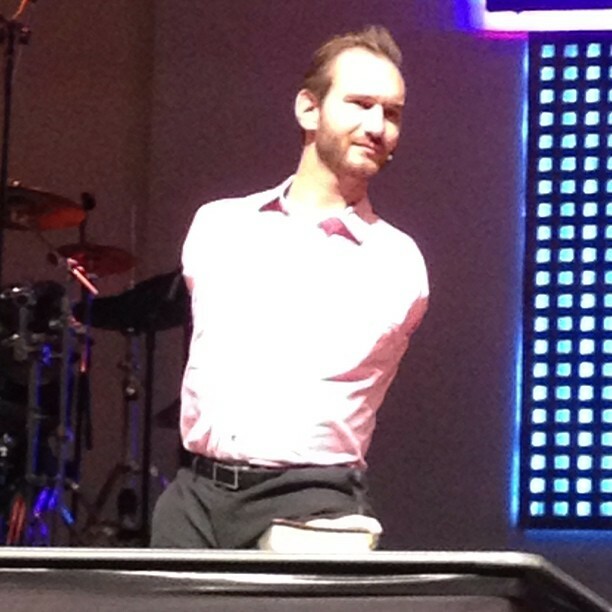 Nick Vujicic. Born without limbs. No arms, no hands, no fingers. No legs either. He has an appendage with which he can grasp because there are two toes. But whilst without limbs, he lived life without limits too. He spoke with passion, connecting especially with the young folk. Inspiring and challenging many. It was indeed a worthwhile trip. Thankful for the cheap airfare! Looking forward to one day having him closer to home here…. ! This entry was posted on 30/08/2013 at 22:45 and is filed under Parenting, Personal. You can follow any responses to this entry through the RSS 2.0 feed. You can leave a response, or trackback from your own site.